To understand autism at all and at the same time as the basis for support for AS-people both the change and the addition to the previous perspective are needed. The previous „understanding“ of autism was marked by both static and isolated perspective. Only on the basis of these new perspectives and theories an understanding of autism and hence the development of assistance and subsidies is possible at all. As shown in Volume 1 [Bernhard J. Schmidt: Autistic and society. An angry change of perspective: Understandig autism] a new vision based on the results of social psychology is required to understand the phenomenon autism. NT-man as acting consciously, rationally and autonomously (CRAAM-Dogma). This has been repeatedly disproved by social psychology. 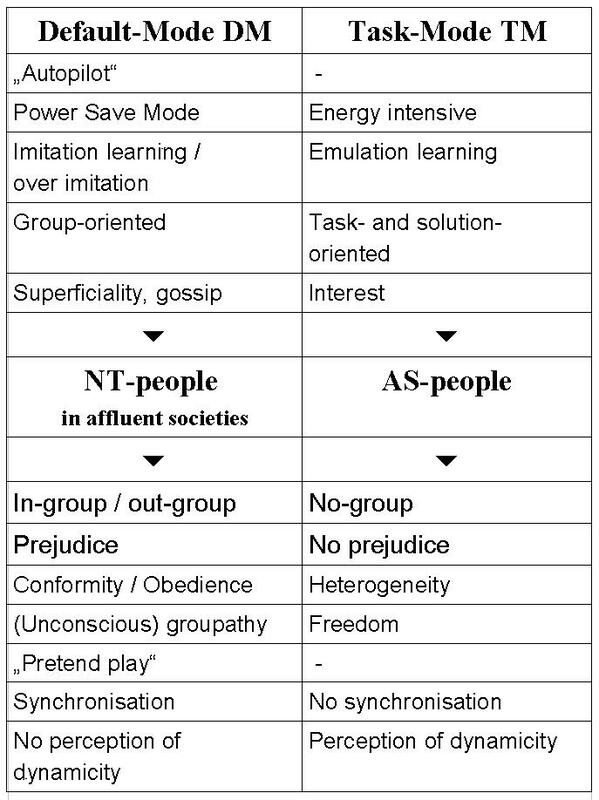 NT people act to a large extent unconsciously, irrationally and dependent on groups [e.g. Bargh (2014)]. The perspective of an ideal NT observer on „sick“ autistic to be healed. Instead, the interaction and communication between NT and AS–people must be considered. The designation of the impairment of communication and interaction as a ‚social‘. But with NT-man it is just not social, but strongly dependent on group affiliation. Interaction and communication quickly find their limits outside of the group. 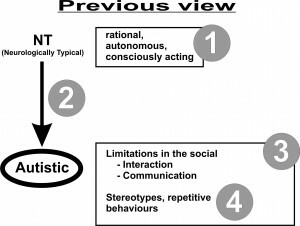 The definition of stereotyped and repetitive behaviours as symptoms of autism. But these are, at least for the most part consequences of anxiety and stress. NT people to a large extent act unconsciously. Through facial expressions, gestures and imitation an unconscious group communication takes place. This group communication acts like a ‚autopilot‘. This means that NT people act unconsciously and depending on the group in many cases. Autistic are not in a position for this unconscious group communication and interaction. While for NT people gossip makes up a major part of the communication, (as part of the unconscious group communication) autistic communicate almost 100% pure factual content. The impairment of communication and interaction is not ‚social‘ but an impairment of ‚unconscious group‚ communication and interaction. Autism is thus, as left-handedness, its own way of being. This is characterized by the impairment of the unconscious group communication and interaction as well as a frequent sensory (over)sensitivity. 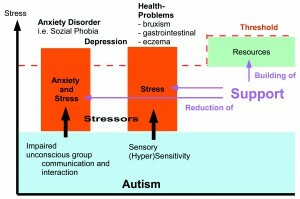 By affecting the subconscious group communication stress and anxiety occur. Because of sensory sensitivity additional stress arises in an over stimulated environment. From this combination of anxiety and stress then clinically relevant disorders such as depression, anxiety disorders, etc. can occur. And this as a result of interaction and communication with both the socio-cultural environment in general, as well as various groups in particular. 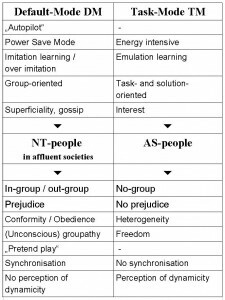 The perception of the two modes „Default“ and „Task“ is central to the understanding of the interaction between NT and AS–people in a technically oriented affluent society. This theory is based on results of brain research with imaging techniques as fMRI (functional magnetic resonance imaging). By means of this one has identified two separate networks in the brain, the DMN „Default Mode network“ and the TPN „task positive network“ [e.g. Jack (2012), Weng (2010), Assaf (2010)], which are mutually exclusive. That is, either one or the other is active, but never both simultaneously. Without going further into the neurological details should be noted that the degree of complexity of the statement should not be lower than the degree of complexity of the descriptive behaviour. To want to derive the complex behaviours of DM and TM of two neural networks alone would thus fall short. The investigations into the DMN and TPN thus serve only as inspiration and basis for the following remarks. The TM „Task Mode“ is responsible for solving problems and tackling tasks. This requires on the one hand of course activity, but also the willingness to new, creative solutions. The basis is a conscious communication via information that is or could be relevant for problem solving or task accomplishment. Until the strong simplification of daily life by the progress of technology, people were mainly in „Task Mode“. The DM „Default Mode“ is opposite to the „Task Mode“. The two are mutually exclusive. The DM is responsible for group formation and retention. In DM „grooming“ in the form of gossip is operated. In addition, the unconscious group communication takes place. The „Default Mode“ is the power saving mode, the autopilot. By the technical achievements and the resulting facilitation of daily life NT people are almost entirely in DM. Although thanks to technological advances being located in a convenient world AS-people, unlike NT-people still constantly are in Task Mode. That is that autistic people are in a constant state of activity and of the information-related communications. Problem solving, knowledge acquisition, etc. are always in the focus of autistic. 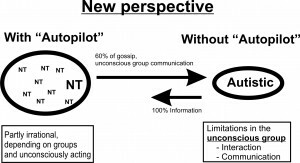 NT people have in DM (in which they predominantly are) an „autopilot“, which automatically and unconsciously performs much of the actions and decisions of NT people [e.g. Bargh (2014)]. The basic situation of NT people in an affluent society is similar to a cockpit, reduced in the light and sound and the instruments and switches are barely visible. The autopilot does both flying and navigation. He works on the unconscious contact with the other, surrounding auto­pilots. So all fly at the same speed in the same direction [see, e.g. Tantam (2009)], although it is the wrong one. By the autopilot NT-people are synchronized with each other in terms of time, speed and direction. Reason and freedom on the other hand would mean to turn off the autopilot as far as possible, to re-steer by hand and navigate. This autopilot is missing in people with autism. The impairment of the unconscious (group) interaction and communication is a symptom of the lack. The fact that this learning, answering these questions, is very energy-intensive and time-consuming, and connected with the risk of some crashes and wrong turns, should be understood. Switching to autopilot is not possible. The „Default Mode“ is contrary to the „Task Mode“. Autistic people lack the „Default Mode“ and for them it can be difficult to switch from the „Task“ to „Default Mode“ and therefore they are almost constantly in the „Task Mode“. The absence of the autopilot has far-reaching conse­quences for AS-people. Autistic and society. An angry change of perspective. Agroskin, Dmitrij; Klackl, Johannes; Jonas, Eva (2014): The self-liking brain: a VBM study on the structural substrate of self-esteem. In: PloS one 9 (1), S. e86430. DOI: 10.1371/journal.pone.0086430. Assaf, Michal; Jagannathan, Kanchana; Calhoun, Vince D.; Miller, Laura; Stevens, Michael C.; Sahl, Robert et al. (2010): Abnormal functional connectivity of Default Mode sub-networks in autism spectrum disorder patients. In: NeuroImage 53 (1), S. 247–256. DOI: 10.1016/j.neuroimage.2010.05.067. Attwood, Tony; Gray, Carol (1999): The Discovery of „Aspie“ Criteria. Autismus Mittelfranken e.V. : Stellungnahme gegen ABA. Online verfügbar unter http://www.autismus-mfr.de/images/articles/Stellungnahme_gegen_ABA.pdf.Baumeister, Roy F.; Tice, Dianne M. (1990): Point-Counterpoints: Anxiety and Social Exclusion. In: Journal of Social and Clinical Psychology 9 (2), S. 165–195. DOI: 10.1521/jscp.1990.9.2.165. Bertilsdotter Rosqvist, Hanna (2012): Practice, practice: notions of adaptation and normality among adults with Asperger Syndrome. In: Disability Studies Quarterly 32 (2). BOSQUET, MICHELLE; EGELAND, BYRON (2006): The development and maintenance of anxiety symptoms from infancy through adolescence in a longitudinal sample. In: Develop. Psychopathol. 18 (02). DOI: 10.1017/s0954579406060275. 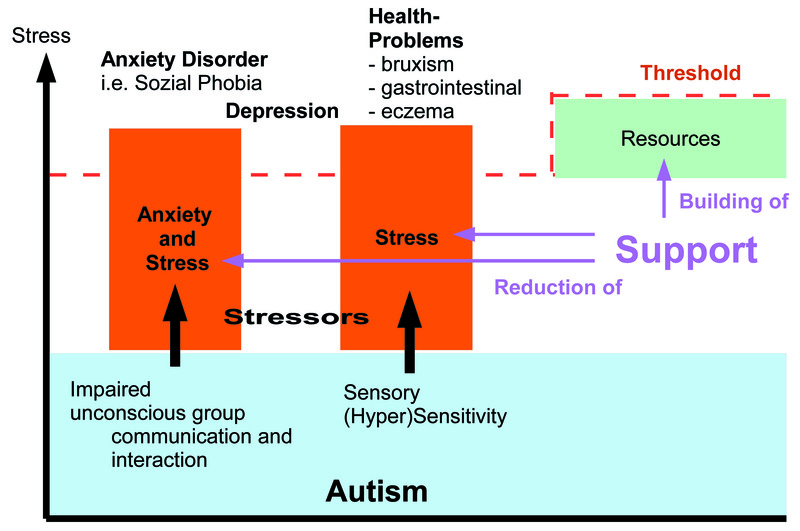 Corbett, Blythe A.; Simon, David (2014): Adolescence, Stress and Cortisol in Autism Spectrum Disorders. In: OA Autism 1 (1), S. 2-. Dörner, Klaus (1984): Bürger und Irre. Zur Sozialgeschichte und Wissenschaftssoziologie der Psychiatrie. 2., überarb. Neuaufl. Frankfurt am Main: Europ. Verl.-Anst (Taschenbücher Syndikat, EVA, 27). Downey, Geraldine; Feldmann, Scott I. (1996): Implications of Rejection Sensitivity für Intimate Relationships. In: Journal of Personality and Social Psychology (6), S. 1327–1343. Erban, Tanja (2004): Psychosoziale Problembereiche der Erziehung und Bildung. Hg. v. Lehrstuhl für Pädagogik. TU München. Online verfügbar unter https://web.archive.org/web/20050128004930/http://www.lrz-muenchen.de/~erbanpublikationen/pdf/erbanpsychosozproblember.pdf.Erikson, Erik H. (1973): Identität und Lebenszyklus. Drei Aufsätze. 1. Aufl. Frankfurt am Main: Suhrkamp (16). Eussen, M. L.; Van Gool, A. R.; Verheij, F.; De Nijs, P. F.; Verhulst, F. C.; Greaves-Lord, K. (2013): The association of quality of social relations, symptom severity and intelligence with anxiety in children with autism spectrum disorders. In: Autism 17 (6), S. 723–735. DOI: 10.1177/1362361312453882. Farrugia, S.; Hudson, J. (2006): Anxiety in Adolescents With Asperger Syndrome: Negative Thoughts, Behavioral Problems, and Life Interference. In: Focus on Autism and Other Developmental Disabilities 21 (1), S. 25–35. DOI: 10.1177/10883576060210010401. Foerster, Heinz von: Etika in kibernetika drugega razreda. Ethics and second order cybernetics. In: Kairos.Foerster, Heinz von; Köck, Wolfram K.; Schmidt, Siegfried J. (1993): Wissen und Gewissen. Versuch einer Brücke. Frankfurt am Main: Suhrkamp (876). Forgas, Joseph P.; Williams, Kipling D. (Hg.) (2002): The Social Self: Cognitive, Interpersonal and Intergroup Perspectives // The social self. Cognitive, interpersonal, and intergroup perspectives. New York: Psychology Press (v. 4). Freud, Sigmund (1913): Totem und Tabu. Einige Übereinstimmungen im Seelenleben der Wilden und der Neurotiker. Leipzig, Wien: Heller. Grandgeorge, Marine; Tordjman, Sylvie; Lazartigues, Alain; Lemonnier, Eric; Deleau, Michel; Hausberger, Martine (2012): Does pet arrival trigger prosocial behaviours in individuals with autism? In: PloS one 7 (8), S. e41739. DOI: 10.1371/journal.pone.0041739. Grzadzinski, R. L.; Luyster, R.; Spencer, A. G.; Lord, C. (2014): Attachment in young children with autism spectrum disorders: An examination of separation and reunion behaviours with both mothers and fathers. In: Autism 18 (2), S. 85–96. DOI: 10.1177/1362361312467235. Haslam, S. Alexander; Jetten, Jolanda; Postmes, Tom; Haslam, Catherine (2009): Social Identity, Health and Well-Being: An Emerging Agenda for Applied Psychology. In: Applied Psychology 58 (1), S. 1–23. DOI: 10.1111/j.1464-0597.2008.00379.x. Haun, Daniel B. M.; Tomasello, Michael (2011): Conformity to Peer Pressure in Preschool Children. In: Child Development 82 (6), S. 1759–1767. DOI: 10.1111/j.1467-8624.2011.01666.x. Ho, Shu-Hsun; Lin, Yu-Ling; Lee, Ruei-Hau (2015): Exploring the Effective Help for Social Anxiety: MMORPGs Delivering Online Help. In: IJMS 7 (2). DOI: 10.5539/ijms.v7n2p10. Hollin, Gregory (2014): Autism, sociality, and human nature. somatosphere.net. Online available http://somatosphere.net/2014/06/autism-sociality-and-human-nature.html. Jack, Anthony I.; Dawson, Abigail J.; Begany, Katelyn L.; Leckie, Regina L.; Barry, Kevin P.; Ciccia, Angela H.; Snyder, Abraham Z. (2013): fMRI reveals reciprocal inhibition between social and physical cognitive domains. In: NeuroImage 66, S. 385–401. Jarymowicz, Maria; Bar-Tal, Daniel (2006): The dominance of fear over hope in the life of individuals and collectives. In: Eur. J. Soc. Psychol. 36 (3), S. 367–392. DOI: 10.1002/ejsp.302. Jaspers, Karl (1997): Die Unabhängigkeit des philosophierenden Menschen. Ungekürzte Fassung. München: Dt. Taschenbuch-Verl. (8369 : Die Taschenbibliothek). Jost, Tina (2012): Die berufliche Situation von Personen mit Asperger-Syndrom. Psychologische Voraussetzungen und Probleme. Diplomarbeit. Universität Wien. Online verfügbar unter http://othes.univie.ac.at/21143/. Karmiloff-Smith, Annette (1998): Development itself is the key to understanding developmental disorders. In: Trends in Cognitive Sciences 2 (10), S. 389–398. Karmiloff-Smith, Annette (2009): Nativism versus neuroconstructivism: Rethinking the study of developmental disorders. In: Developmental Psychology 45 (1), S. 56–63. DOI: 10.1037/a0014506. Katagiri, Masatoshi; Inada, Naoko; Kamio, Yoko (2010): Mirroring effect in 2- and 3-year-olds with autism spectrum disorder. In: Research in Autism Spectrum Disorders 4 (3), S. 474–478. DOI: 10.1016/j.rasd.2009.11.004. Keenan, Michael; Kerr, Ken P.; Dillenburger, Karola (2000): Parents‘ education as autism therapists. Applied behaviour analysis in context. London: Jessica Kingsley. Kiep, Michelle; Spek, Annelies A.; Hoeben, Lisette (2015): Mindfulness-Based Therapy in Adults with an Autism Spectrum Disorder: Do Treatment Effects Last? In: Mindfulness 6 (3), S. 637–644. DOI: 10.1007/s12671-014-0299-x. Kuusikko, Sanna; Pollock-Wurman, Rachel; Jussila, Katja; Carter, Alice S.; Mattila, Marja-Leena; Ebeling, Hanna et al. (2008): Social Anxiety in High-functioning Children and Adolescents with Autism and Asperger Syndrome. In: J Autism Dev Disord 38 (9), S. 1697–1709. DOI: 10.1007/s10803-008-0555-9. Leary, Mark R. (1990): Responses to Social Exclusion: Social Anxiety, Jealousy, Loneliness, Depression, and Low Self-Esteem. In: Journal of Social and Clinical Psychology 9 (2), S. 221–229. DOI: 10.1521/jscp.1990.9.2.221. Leary, Mark R. (2002): The Interpersonal Basis of Self-Esteem. In: Joseph P. Forgas und Kipling D. Williams (Hg. ): The Social Self: Cognitive, Interpersonal and Intergroup Perspectives // The social self. Cognitive, interpersonal, and intergroup perspectives. New York: Psychology Press (v. 4). Liebal, Kristin; Colombi, Costanza; Rogers, Sally J.; Warneken, Felix; Tomasello, Michael (2007): Helping and Cooperation in Children with Autism. In: J Autism Dev Disord 38 (2), S. 224–238. DOI: 10.1007/s10803-007-0381-5. 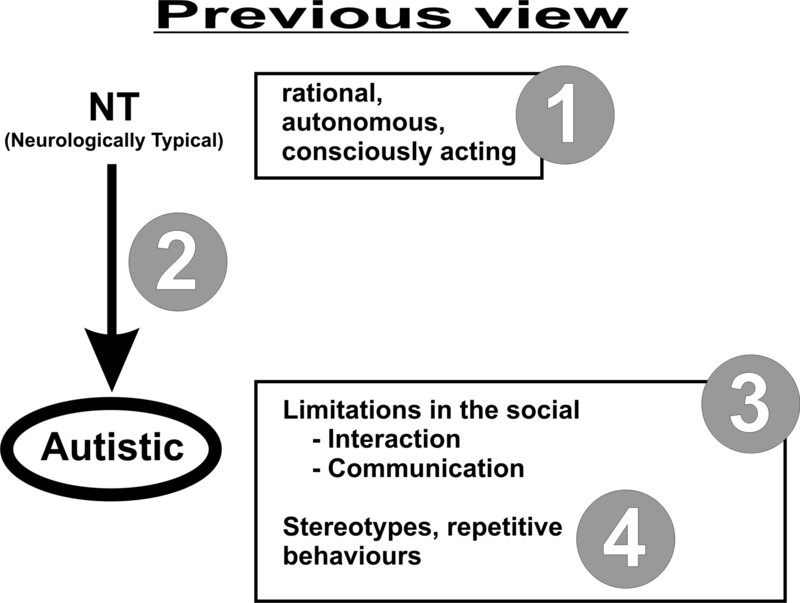 López, Beatriz (2015): Beyond Modularisation: The Need of a Socio-Neuro-Constructionist Model of Autism. In: J Autism Dev Disord 45 (1), S. 31–41. Lumsden, Joanne; Miles, Lynden K.; Macrae, C. Neil (2014): Sync or sink? Interpersonal synchrony impacts self-esteem. In: Frontiers in psychology 5, S. 1064. Manassis, K.; Bradley, S. J. (1994): The development of childhood anxiety disorders: Toward an integrated model. In: Journal of Applied Developmental Psychology 15 (3), S. 345–366. DOI: 10.1016/0193-3973(94)90037-X. Mandy, W.; Murin, M.; Baykaner, O.; Staunton, S.; Hellriegel, J.; Anderson, S.; Skuse, D. (2015): The transition from primary to secondary school in mainstream education for children with autism spectrum disorder. In: Autism. Menzies Lyth, Isabel (1960): Social Systems as a Defense Against Anxiety. An Empirical Study of the Nursing Service of a General Hospital. In: Human Relations (13), S. 95–121. Millward, Claire; Ferriter, Michael; Calver, Sarah J.; Connell-Jones, Graham G.: Gluten- and casein-free diets for autistic spectrum disorder. DOI: 10.1002/14651858.cd003498.pub3. Osborne, Lisa A.; McHugh, Louise; Saunders, Jo; Reed, Phil (2008): Parenting stress reduces the effectiveness of early teaching interventions for autistic spectrum disorders. In: Journal of autism and developmental disorders 38 (6), S. 1092–1103. DOI: 10.1007/s10803-007-0497-7. Páez, Dario; Rimé, Bernard; Basabe, Nekane; Wlodarczyk, Anna; Zumeta, Larraitz (2015): Psychosocial Effects of Perceived Emotional Synchrony in Collective Gatherings. In: Journal of Personality and Social Psychology. DOI: 10.1037/pspi0000014. Potvin, M.-C.; Snider, L.; Prelock, P. A.; Wood-Dauphinee, S.; Kehayia, E. (2014): Health-related quality of life in children with high-functioning autism. In: Autism 19 (1), S. 14–19. DOI: 10.1177/1362361313509730. psyGA: Daten und Fakten. Online verfügbar unter http://psyga.info/psychische-gesundheit/daten-und-fakten/. Sanefuji, Wakako; Yamashita, Hiroshi; Ohgami, Hidehiro (2009): Shared minds: Effects of a mother’s imitation of her child on the mother-child interaction. In: Infant Ment. Health J. 30 (2), S. 145–157. DOI: 10.1002/imhj.20208. Schmidt, Bernhard J. (2015): Autist und Gesellschaft – Ein zorniger Perspektivenwechsel. Band 1: Autismus verstehen. 1. Aufl. Norderstedt: Books on Demand. Schmidt, Bernhard J. (2015a): Autismen. Aphorismen eines Autisten. 1. Aufl. Norderstedt: Books on Demand. Schmidt, Bernhard Johannes (2015b): Vernunft und Freiheit. bei Thomas von Aquin. 1. Aufl. Norderstedt: Books on Demand. Schore, Allan N. (2014): Early interpersonal neurobiological assessment of attachment and autistic spectrum disorders. In: Front. Psychol. 5. DOI: 10.3389/fpsyg.2014.01049. Singh, Nirbhay N.; Lancioni, Giulio E.; Winton, Alan S. W.; Karazsia, Bryan T.; Myers, Rachel E.; Latham, Larry L.; Singh, Judy (2014): Mindfulness-Based Positive Behavior Support (MBPBS) for Mothers of Adolescents with Autism Spectrum Disorder: Effects on Adolescents’ Behavior and Parental Stress. In: Mindfulness 5 (6), S. 646–657. Sivaratnam, Carmel S.; Newman, Louise K.; Tonge, Bruce J.; Rinehart, Nicole J. (2015): Attachment and Emotion Processing in Children with Autism Spectrum Disorders: Neurobiological, Neuroendocrine, and Neurocognitive Considerations. In: Rev J Autism Dev Disord 2 (2), S. 222–242. DOI: 10.1007/s40489-015-0048-7. Smith, Phil; Routel, Christie (2010): Transition Failure: The Cultural Bias of Self-Determination and the Journey to Adulthood for People with Disabilities. In: Disability Studies Quarterly 30 (1).Tantam, Digby (2003): The Challenge of adolescents and adults with Asperger syndrome. In: Child And Adolescent Psychiatric Clinics (12), S. 143–163. Tantam, Digby (2009): Can the world afford autistic spectrum disorder? Nonverbal communication, asperger syndrome and the interbrain. London, Philadelphia: Jessica Kingsley Publishers. Tantam, Digby (2014): Adults with ASD. In: Curr Dev Disord Rep 1 (1), S. 1–7. DOI: 10.1007/s40474-013-0005-z. Tomasello, Michael (2006): Die kulturelle Entwicklung des menschlichen Denkens. Zur Evolution der Kognition. 1. Aufl. Frankfurt am Main: Suhrkamp (1827). Tomasello, Michael (2014): A natural history of human thinking. Tordjman, Sylvie; Davlantis, Katherine S.; Georgieff, Nicolas; Geoffray, Marie-Maude; Speranza, Mario; Anderson, George M. et al. (2015): Autism as a Disorder of Biological and Behavioral Rhythms: Toward New Therapeutic Perspectives. In: Front. Pediatr. 3. DOI: 10.3389/fped.2015.00001. Weiss, Jonathan A.; Robinson, Suzanne; Fung, Stephanie; Tint, Ami; Chalmers, Philip; Lunsky, Yona (2013): Family hardiness, social support, and self-efficacy in mothers of individuals with Autism Spectrum Disorders. In: Research in Autism Spectrum Disorders 7 (11), S. 1310–1317. Weng, Shih-Jen; Wiggins, Jillian Lee; Peltier, Scott J.; Carrasco, Melisa; Risi, Susan; Lord, Catherine; Monk, Christopher S. (2010): Alterations of resting state functional connectivity in the default network in adolescents with autism spectrum disorders. In: Brain Research 1313, S. 202–214. DOI: 10.1016/j.brainres.2009.11.057. Woodman, Ashley C.; Smith, Leann E.; Greenberg, Jan S.; Mailick, Marsha R. (2015): Change in Autism Symptoms and Maladaptive Behaviors in Adolescence and Adulthood: The Role of Positive Family Processes. In: J Autism Dev Disord 45 (1), S. 111–126. DOI: 10.1007/s10803-014-2199-2. Wright, Cheryl A.; Wright, Scott D.; Diener, Marissa L.; Eaton, Jacqueline (2014): Autism spectrum disorder and the applied collaborative approach: a review of community based participatory research and participatory action research. In: J Autism 1 (1), S. 1. DOI: 10.7243/2054-992X-1-1. Wright, H. F.; Hall, S.; Hames, A.; Hardiman, J.; Mills, R.; Mills, D. S. (2015): Acquiring a Pet Dog Significantly Reduces Stress of Primary Carers for Children with Autism Spectrum Disorder: A Prospective Case Control Study. In: Journal of autism and developmental disorders. DOI: 10.1007/s10803-015-2418-5.